AdvisorBenchmarking is WealthManagement.com’s research practice, providing insights on financial advisor best practices and sentiment to the community of advisors and the industries that serve them. 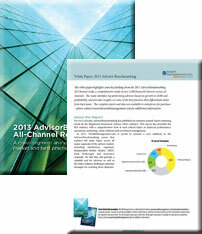 In addition to the RIA Trend Report, which has been published since 1999, AdvisorBenchmarking is proud to announce the first annual All-Channel Report that explores best practices across all segments of the advisory business (i.e. RIA, IBD, wirehouse/national, regional, bank brokerage and insurance). This comprehensive study includes responses from over 2,400 advisors, making it among the largest of its kind. AdvisorBenchmarking also produces custom research as well as the Advisor Confidence Index (ACI). The inaugural All-Channel study includes data and insights on financial performance, practice management and operations, investment management, alternative investments, exchange traded funds, marketing and client relations, and the economic and business outlook. It also identifies some best practices of top performing FAs based on AUM and profit growth. This four-page white paper highlights some key findings of the full study. Please contact [email protected] to learn more about the full report, which is available for enterprise purchase. For over a decade the annual AdvisorBenchmarking RIA Trend Report has provided registered investment advisors with data and insights to help them better manage and grow their practices, and helped the firms who serve them deepen their understanding of this increasingly important advisor market segment. WealthManagement.com's Advisor Confidence Index (ACI) is a monthly benchmark with an eight-year history that gauges registered investment advisor views on the U. S economy and the stock market. ACI data is compiled from a survey of 100+ panel members that work at leading RIA firms who are prequalified for their industry experience and assets under management. The ACI is released monthly to the press and is often quoted as a sentiment of advisor confidence.